Image by the Lunar Reconnaissance Orbiter Camera science team. Caption by Adam Voiland, with information from the NASA Office of Communications and Arizona State University. On December 24, 1968, during a live Christmas Eve broadcast from orbit around the Moon, Apollo 8 astronauts shared a spectacular image of Earth rising on the lunar horizon. The image, known as Earthrise, offered us one of the first views of our planet as it appears from deep space. The photograph has become one of the most recognizable views of our home and is often credited with inspiring the nascent environmental movement to become a political force. Forty-seven years later, a spacecraft orbiting the Moon has captured a new view (above) that is reminiscent of the 1968 image. The image is composite made from a series of images taken by the Lunar Reconnaissance Orbiter Camera (LROC) on October 12, 2015. When it was acquiring the images, the Lunar Reconnaissance Orbiter was about 83 miles (134 kilometers) above Compton crater on the Moon’s far side. In this view, the center of Earth’s disk is 4.04 degrees North, 12.44 degrees West, just off the coast of Liberia. The large tan area in the upper right is the Sahara Desert and Saudi Arabia. The Atlantic coast of South America is visible to the west. Although LRO experiences twelve earthrises every day, the spacecraft is usually focused on the lunar surface. When LROC captured this view, the camera was pointed off into space in order to make observations of the lunar atmosphere and to perform instrument calibration. 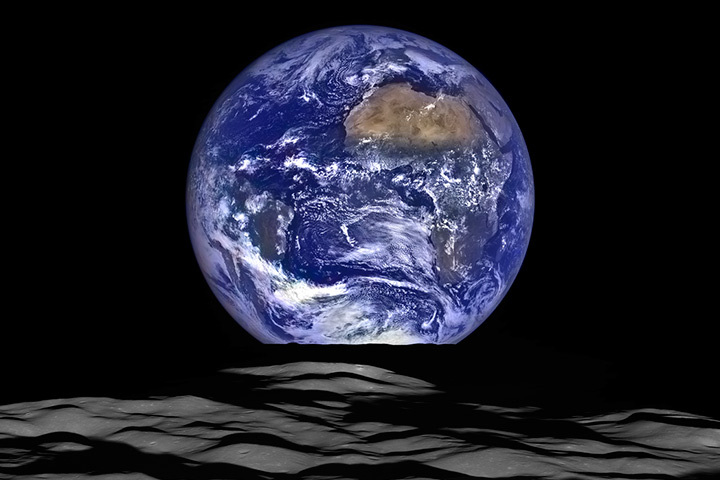 Earth passed through the camera’s field of view at the time, making an earthrise image possible. Capturing an attractive and realistic image of the Earth and Moon in one scene with the LROC is not simple. Since the spacecraft, Earth, and the Moon are all in motion, LROC’s science team had to do some special processing. The LROC’s high-resolution Narrow Angle Camera only takes black-and-white images, so the team also had to merge NAC observations with color information from LROC’s lower-resolution Wide Angle Camera to produce the image above. In addition to sharpening Earth and adding color from the WAC, the LRO team made some adjustments to the contrast to accentuate details on the lunar surface. In the strip of images directly above, the Earth and Moon have the same contrast stretch in the image on the left. In the center image, the brightness of the Moon has been increased relative to the Earth. In the image on the right, color from the WAC has been overlain on Earth. Note that the colors of Earth from the WAC are only approximately what an astronaut would see from the Moon because the human eye is fully sensitive to all colors across the visible wavelength range, whereas the WAC sees through a set of narrow band filters. The color of Earth here combines the 604 nm (orange), 556 nm (yellow-green), and 415 nm (violet) bands displayed in red, green, and blue, respectively. Arizona State University (2015, December 18) Looking Over The Limb. Accessed December 23, 2015. NASA (2015, December 18) NASA Releases New High-Resolution Earthrise Image. Accessed December 23, 2015. 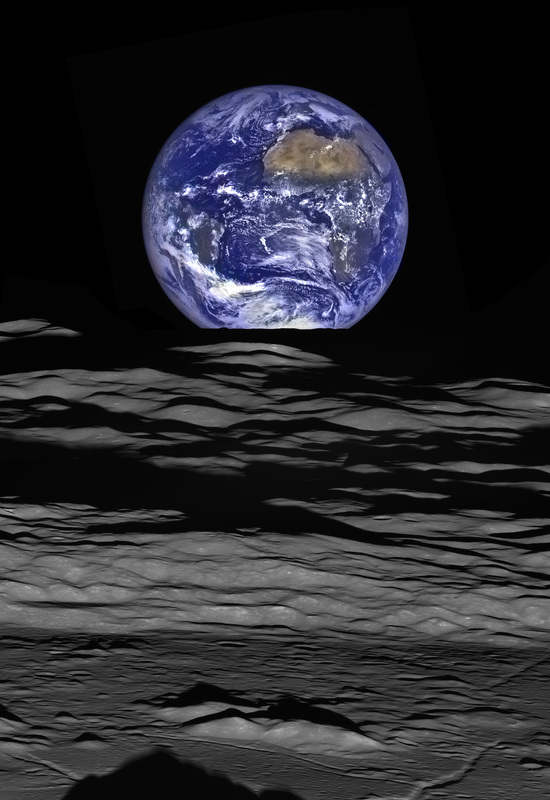 NASA (2015, December 18) Earthrise at Christmas. Accessed December 23, 2015. NASA (2007, September 25) Christmas Eve Broadcast. Accessed December 23, 2015. Yale University Press (2008, November 6) Earthrise. Accessed December 23, 2015. NASA (2012, March 29) Apollo Astronaut Shares Story of NASA’s Earthrise Photo. Accessed December 23, 2015.